I love sewing my girls matching outfits. Weird? I think so, but still its so much fun. Plus, in reality they are only going to want to match each other for a couple more years so I have to take advantage of it! I did make a few changes though...I used fabric, so I needed to ruffle each piece of fabric. I also used my serger to serge the bottom edges of each ruffled fabric. I also made the shirts, because they had no white shirts without stains on them....any other moms out there run into this problem...all...the...time?! For the shirts I used 2 inch white ruffle fabric. I will be adding a tutorial on how I did that later on. The skirts all laid out after being completed. I am so grateful that I have been given the ability to sew for my girls. They love every...piece...that I make for them. I know that won't last forever, but I love it for now! Super cute skirts!!! I love the ruffles!!! Oh. My. Gosh. 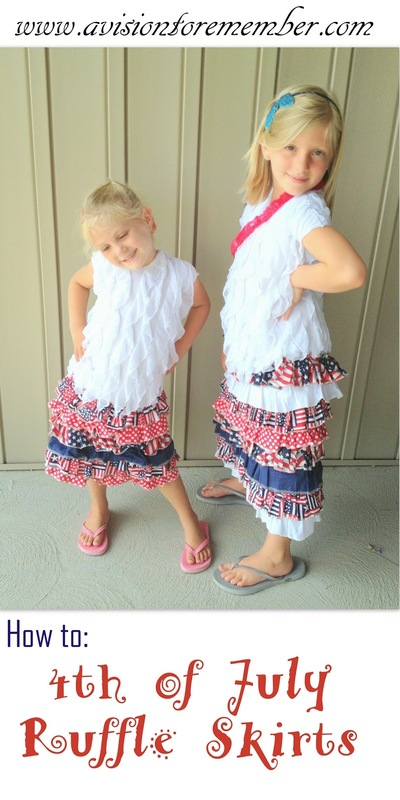 What could be cuter than these red, white, and blue ruffle skirts on these adorable models?? And the shirts, too? You are super-talented! Thank you for sharing these with us at Treasure Box Tuesday- pinning! :) Happy 4th of July! I love me some ruffles and I love me some matching outfits!!! You may get lucky, my daughters are 9 and 11 and they still like to match on days that they like each other. Now if they having been fighting all day its a different story. Thanks for sharing at #HomeMattersParty hope you will join us again next week! !